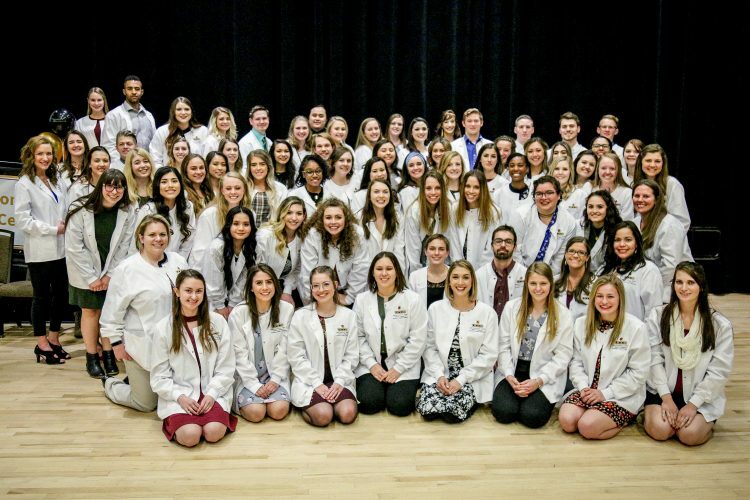 Nursing students in the Helen and Arthur E. Johnson Beth-El College of Nursing and Health Sciences took their oath to patient care and were “cloaked” by the faculty in the college’s inaugural White Coat Ceremony Jan. 28 in Berger Hall. 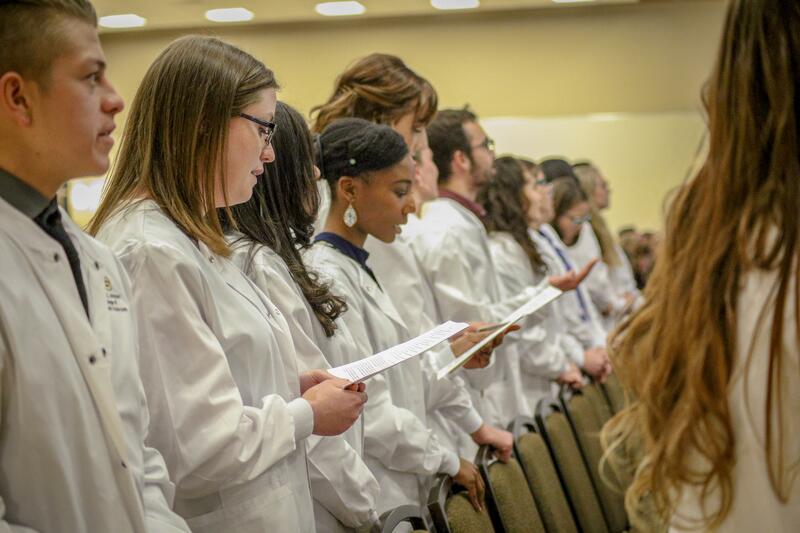 The ceremony is considered a rite of passage to emphasize the importance of compassionate patient care for students at the start of the nursing program. The 113 students from the two undergraduate nursing options received their coat in front of their invited families and friends. The Gold Foundation provided a pin for each student, and a personal note from faculty members were in each coat the student received. Stephanie Hanenberg delivers the keynote address for the inaugural White Coat Ceremony. 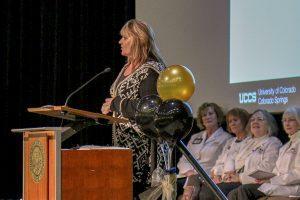 Stephanie Hanenberg, executive director of health and wellness who received her bachelor’s and master’s degrees in nursing at UCCS, delivered the keynote address. She shared aspects of her nursing journey to the students and conveyed the highlights of her career in compassionate and respectful care. Amy Silva-Smith, interim dean and professor of nursing, and Deborah Pollard, chair and associate professor of nursing, participated in the ceremony with the nursing faculty. Two students who received their coats also presented musical selections for the ceremony. The White Coat Ceremony was initiated in 1993 at Columbia University’s Vagelos College of Physicians & Surgeons by Arnold P. Gold, M.D., who was a professor and pediatric neurologist. Dr. Gold, a passionate advocate for humanistic healthcare, believed that the oath taken by new physicians at the end of medical school came too late. 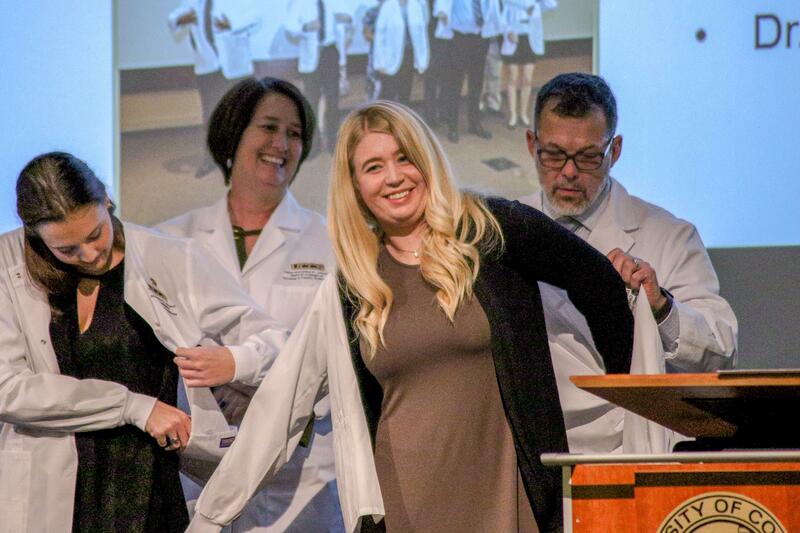 Through the nonprofit organization that he and his wife, Dr. Sandra Gold, started, The Arnold P. Gold Foundation has expanded the White Coat Ceremony around the globe. 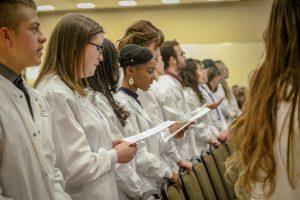 Nursing students take the oath to patient care during the White Coat Ceremony. Funding for inaugural ceremony at UCCS was provided by the Gold Foundation through the generous support of its trustee and donor Elaine Adler. 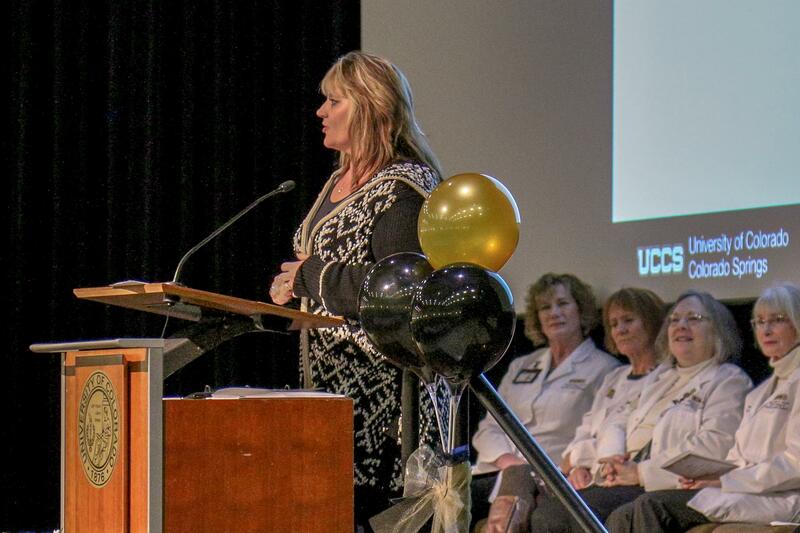 UCCS was among 50 nursing schools selected in 2018 to launch their first White Coat Ceremony. Today, nearly every medical school in the United States, hundreds of nursing schools, and many other health profession schools around the globe participate in this tradition of humanistic care. The Gold Foundation champions the human connection in healthcare. The foundation engages schools and their students, health systems, companies, and individual clinicians in the joy and meaning of humanistic healthcare, so that patients and their families can be partners in collaborative, compassionate and scientifically excellent care. For more information about the White Coat Ceremony and the Gold Foundation, visit www.gold-foundation.org. Nursing students who received their white coats during the inaugural ceremony Jan. 28. This was such a moving ceremony and it made me so proud to be a part of the college that is bringing future nurses into the profession. So proud of Beth-El!